kataan.org » what is a lomo? The LOMO (leningr.dskoje optiko mechanitsch.skoje objedini.nie) LC-A is a little Russian compact camera. It’s got a wonderfully vivid lens, simple construction, great feel, and primitive shutter design that will stay open for up to 2 minutes in low light. The creative possibilities are endless. The LOMO LC-A is the first camera I reach for. I tried toÂ remember the first time I’d heard of LOMO, and I can’tÂ remember exactly where I’d heard of them first. 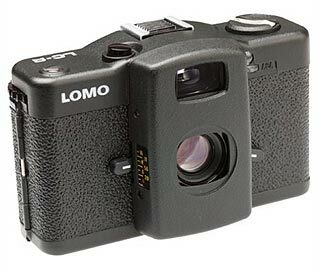 The LOMOÂ was shamelessly copied from a Japanese Cosina CX-2 by the Soviets in the ’80s.Â There’s no autofocus, motor film advance, flash, or automatic film speed setting. The exposure system is a primitive arrangement with a light sensor and capacitor that looks likeÂ something out of aÂ 50-in-1 electronics kit. The wide-angle lens vignettes horribly at times,Â andÂ getting the focusÂ right isÂ total guesswork. However, the zone focus system isÂ fast in decent light or when shooting at infinity – no auto-focus means no lag. The lack of a motor advance makes it wonderful for discrete candid photography – there’s no motor noise to startle your unknowing subject. The 32mm f/2.8 coated lensÂ is faster than any point-and-shoot zoomÂ lens and returns vivid colors. The exposure system will keep the shutter open up to 2 minutes, which allows vivid, surreal photos in any light, even starlight. The vignetting, vivid colors, and sometimes blurry focusÂ is elementalÂ to a photo phenomenon known as Lomography. The photos are hit-and-miss, but when they hit, they are wonderfully vivid captures of my life. The camera feels right in my hand, and I can street shoot with it better than any other camera I’ve tried. The combination of zone focus, quiet shutter, and the feel of the camera seems made for street shooting. The concept of lomography is what appeals to me. To me, photography is about capturing the elements of my life as they occur. My life isn’t made up of composed still-life art and placid landscapes, it’s about city scenes, the interaction ofÂ people around me, the guy at the drive-up window, or a piece of newspaper on the sidewalk.